Returning to her rural hometown of Twin Rivers, Rhode Island, after a fourteen year absence, free-spirited Jane Porter is drawn to Dylan Chadwick, an ex-federal agent and recent returnee fleeing the nightmare of his former life, by an innocent young girl, small-town secrets, and two families struggling to reestablish old relationships. Simultaneous. 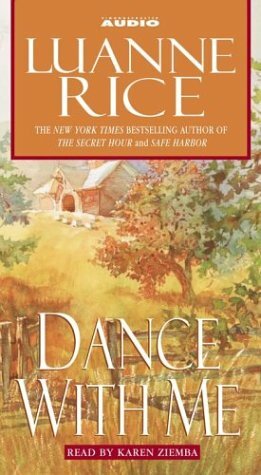 Acclaimed for her insightful depiction of the magic and mystery in everyday life and relationships, Luanne Rice is one of today's most gifted novelists. Now the author of eight consecutive "New York Times bestsellers delivers her most powerful book yet--the story of a man and woman forced to choose between the past that haunts them and the love that won't let them go. Jane Porter left the apple orchards of rural Twin Rivers, Rhode Island, years ago, fleeing memories that could tear two families apart. Now she has been unexpectedly drawn home to her mother and only sister. Dylan Chadwick has come back, too, shedding the steely exterior he wore as a federal agent in order to follow in the footsteps of his apple-farming father and forget the life he once lived. Amid this landscape of loss and renewal, a haunting story of converging lives, small-town secrets--and the magical sway of unexpected miracles--unfolds. Deeply moving and richly told, Dance with Me explores emotional connections at their very core, with keen insights into the lives of mothers and daughters, sisters and lovers that will resonate long after the final page is turned. Luanne Rice is the author of The Perfect Summer, The Secret Hour, Safe Harbor, True Blue, Summer Light, Firefly Beach, Dream Country, Follow the Stars Home -- a Hallmark Hall of Fame feature -- Cloud Nine, Secrets of Paris, Stone Heart, Angels All Over Town, Home Fires, Crazy in Love, which was made into a TNT Network feature movie, and Blue Moon, which was made into a CBS television movie. She lives in New York City and Old Lyme, Connecticut. Visit the author's website at www.luannerice.com.